This year's MIT Sloan Healthcare Innovation Prize (SHIP) went to a revolutionary pair of contact lenses that can dispense medication directly into a wearer's eye. The Harvard designers that came up with these contacts say they believe their contacts could improve the way doctors treat eye diseases in the coming decades. Officially called Theraoptix, these new contacts were made with tiny polymer films that can hold a few weeks supply of medication. Although these films are located around the eyes' lenses, scientists say they do not obstruct vision. Researchers said they designed Theraoptix to help with a wide range of eye disorders. Not only could these contacts dispense intraocular pressure (IOP) reducing drops to glaucoma patients, they could also dramatically improve recovery time from people who just had eye surgery. A few other common diseases doctors hope Theraoptix could help manage include diabetic retinopathy and age-related macular degeneration (AMD). Although these contacts are ideal for daily usage, Theraoptix designers say certain models could contain two week's worth of medicine. There's no word whether Theraoptix can be worn safely during sleep. 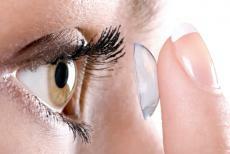 One feature MIT judges liked about these contacts was that they were designed only using FDA-approved materials. This factor will dramatically improve Theraoptix's chances of getting approval for the public market in the near future. Opticians are excited about Theraoptix's potential to improve the quality of eye care. Since Theraoptix's contacts are inside a person's eyes, there's no chance any medicine will flow out of a user's eyes like standard eye drops tend to do. In addition to the media exposure for the winning first place, Theraoptix engineers received $25,000 for further research & development. After the Harvard Medical group, the company Strand Therapeutics took the runner-up position with its new line of mRNA-targeted drugs that could cure certain kinds of cancer. The group Healthcare Hospitality Systems also won a "popular award" for its new sound system that could be used to help with hospital communications. These two teams won $2,000 and $500, respectively. In addition to practicality and marketing potential, MIT SHIP judges evaluate candidates on the bases of innovation and possible regulatory issues. Applicants first have to send a pitch to MIT before they are accepted into the SHIP competition. While any start-up or can enter the MIT SHIP, one team member has to be enrolled at one of the following Massachusetts-based schools: Tufts, Harvard, Boston University, or MIT.